A children’s book published by the American Academy of Sleep Medicine (AASM) is being used to educate at-risk children in Detroit. The non-profit organization Sweet Dreamzzz Inc. has ordered copies of I See the Animals Sleeping: A Bedtime Story to give to each Head Start library in their program. In 2009, Sweet Dreamzzz partnered with the National Center on Sleep Disorders Research to develop the R.E.M. (Rest. Educate. Motivate.) Sleep Program. The program is interactive and involves hands-on activities, games and songs. The goal is to help the children get a good night’s sleep in preparation for classroom learning. Sleep can be a challenge for children in Detroit’s most impoverished communities. Many children in the city may not have a warm, comfortable place to sleep at night. Sweet Dreamzzz reaches out to parents, teachers and students. Parents receive education and bedtime essentials through workshops. Teachers are trained and given lesson plans to use in the classroom. Now, teachers will have the added option of checking out I See the Animals Sleeping to help lessons about sleep. 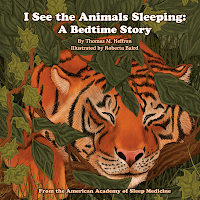 I See the Animals Sleeping: A Bedtime Story can be purchased from Amazon or directly from the AASM. Also available from the AASM is The Animals Sleep: A Bedtime Book of Biomes. Learn more about these books and find other educational resources at SleepEducation.com. This is such great news! A major step in the right direction towards raising awareness about sleep in our nation. Thank you, AASM, National Center on Sleep Disorder Research and Sweet Dreamzzz! What a great story! Love to hear the creative but much needed areas that we are educating the public about sleep awareness. It starts with our kids so what a wonderful project!